I am a junkie. I am embarassed to admit it, but for the last few weeks I have been an addict. It might as well be drugs because I have found a "show" (I feel like I have moved to Boca Raton and retired just saying that) that I can't stop watching. I am so embarassed that I can't even fully tell my friends and family because I can't lay out the premise of the story without sounding like an idiotic 14 year old gothicly inclined romance novel hound. Which is truly unfortunate because the show is Awesome and has many social themes that create a deeper layer. The characters are being fleshed out nicely, the chemistry between the actors is steamy, the quality of their work is great and the story...well it has me scheduling a date with the TV every Sunday at 8. 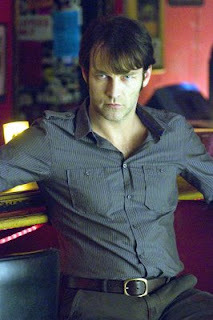 If you haven't watched True Blood yet you should. You are missing out. I really shouldn't be surprised by my addiction considering that True Blood has been written/produced/directed by Alan Ball who also is responsible for my historical junkie status with Six Feet Under. Thanks Alan. I really should be at the gym and I just can't stop watching long enough to manage to leave the house. OMG, I love this show! I'm right there with you, completely addicted!